Fintech focus: Apple Pay, what next? David Brear is the Chief Thinker at Think Different Group Ltd (@TD_Grp on Twitter). He is a FinTech Strategist, Speaker, Scholar & Writer. He spends his time these days helping banks, regulators & governments be better. 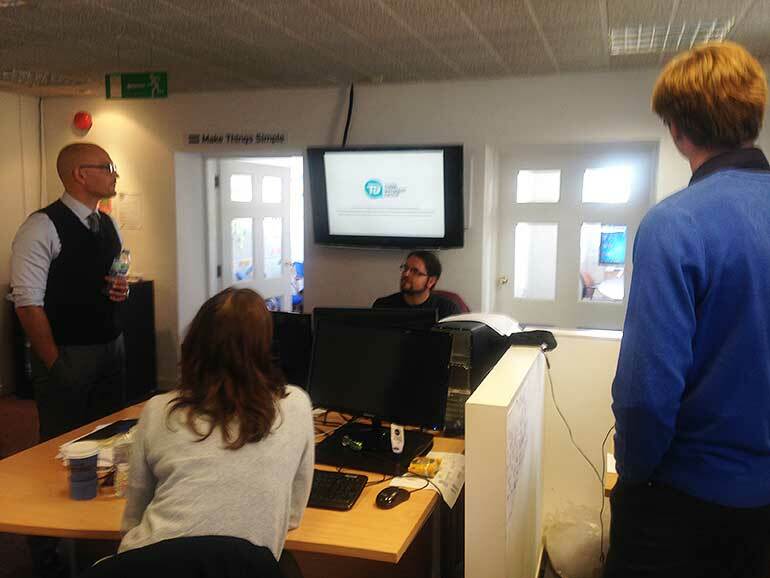 David recently came to Money Dashboard HQ in Edinburgh to visit the team and we enjoyed hearing David speak about how Fintech is changing and how firms like Money Dashboard fit into this (pictured above). This week he speaks to us about Apple Pay and how it fits into the current Fintech landscape. Money Dashboard: What does the advent of Apple Pay represent in the current landscape of digital banking and Fintech? i.e. Is this a sign of momentum increasing and what can we expect to follow? David Brear: Someone of Apples scale entering the payments areana is huge. They have more money, better technology and fundamentally more customers than any bank on the planet meaning the old defence of size and scale that banks had with the likes of startup banks in the 90's is completely eroded. Apples ability to control the hardware and software as well as their ability to negotiate hard with the banks and suppliers in their chains will make them a formidable foe. This coupled with other regulatory changes like PSD 2 mean that the momentum is well and truly with people like Apple. The adoption of ApplePay has been steady and usages seems to be rising well particularly in London with integration into TFLs systems for Tube, Bus etc transportation. The disintermediation threat to banks and card providers like Amex is significant as without a real need to go into your Amex app anymore, seeing as you get a quick touch Id accesses view of your recent payments etc, then they run a real risk on not having as much engagement with their customers as they used to. The could and will lead to a real shift in who the customer thinks they are doing business with and also how banks will have to go about engaging and selling their customers products. Money Dashboard: Where we once had banks and cash withdraw we now have digital bank accounts, personal finance manager apps and easy pay at tills. What does this mean for banks? David Brear: Don't get me wrong cash will be around for at least the next 5 years but significantly reducing over that time period. It isn't safe, clean or traceable and those three things will be the nail in its coffin. Through into the mix the storage costs and security risks for banks holding physical cash and they should be clambering to get rid of it. The issue comes when the banks stop being a system to move paper and people and start becoming that moves bits, bites and value. When the banks truly embrace digital and become digital to the core then the surfacing of services and data through PFM, tills, TV, Branches or anywhere for that matter become a simple enabler for experiences. Money Dashboard: How do you see platforms like Apple Pay and Android Pay changing the perception around currency? David Brear: As it stands I don't see ApplePay or Android Pay being real drivers for a change in perception around currency. They are friction removers from the payment model but not removing significant part of it. Companies and partnerships like the one between Earthport and Ripple on the other hand I think can do huge amounts for really legitimising crypto-currencies which can do a lot more in this space. The whole block-chain and crypto-currencies space has a huge amount of hype around it in the moment with lots of people heralding in the next phase of value transfer but I think we have a long way to go before we get there. David was the Global practice lead for Digital Banking in Gartner until April 2015, when he decided to pursue an independent career with Think Different Group. He is a Digital Financial Services Transformation Consultant, Designer, Technologist, Curator, Consultant, Writer, Speaker, Digital Strategist and general FinTech fanboy. With a deep range of experience and qualifications across a number of digital disciplines gained from over 10 years working at an agency, consultancy and on the client side for a number of top financial services global brands. Having transformed the digital landscape for a number of banks and insurers, David is now working as strategist and advisory to banks looking to take their Digital Transformation to the next level. Boiling it down, and in his own words, David is just an eloquent nerd trying to make banks better. Sign up for personal finance manager Money Dashboard now. Money Dashboard is the free, easy way to save money.